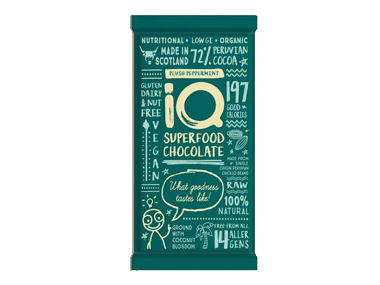 We sell IQ Chocolate products like IQ Plush Peppermint Dairy Free Chocolate Bar online in the UK and directly from our award-winning store in Scotland. Delicious dark dairy and gluten free chocolate bar flavoured with organic peppermint oil. Where can you buy real IQ Plush Peppermint safely online? If you are wondering where you can buy IQ Plush Peppermint Dairy Free Chocolate Bar safely online in the UK, then shop with us. IQ Plush Peppermint - IQ Plush Peppermint Dairy Free Chocolate Bar in Chocolate and Confectionery.